Douglas has shared how he uses both vinegar and baking soda in his laundry, as natural fabric softener and deodorizer rolled into one. I am always looking for more ways to use these two natural ingredients together. The main way I use them regularly is with the laundry. Baking Soda added with your regular detergent in the wash cycle, then add vinegar during the rinse cycle. Vinegar added to your regular detergent in the wash cycle, and then add baking soda during the rinse cycle. This way you get the benefits of both vinegar and baking soda in your laundry. Fresh scent, soft comfortable feeling clothes. My gym clothes came out smelling so good and that never happened with just detergent alone. With the "clear" no scent, no dye liquid Tide, my gym clothes still came out smelling really good because of the vinegar and baking soda. Doug, thanks for sharing how you use these products in your laundry. the baking soda to the wash and vinegar to the rinse, and not vice versa. The reason is that the baking soda helps raise the alkalinity of the water, which naturally helps boost the power of the laundry detergent you are using. Then, the vinegar in the rinse helps remove excess soap from your clothing, which helps keep them soft. I would suggest adding 1/4 cup baking soda, and then 1/2 cup of vinegar to the rinse water. I would caution, however, that the acidity in vinegar, can over time, start to harm the clothing fibers, especially for natural fibers such as cotton, so you may not want to add vinegar every single time unless you have severe laundry detergent allergies and really need to make sure all soap residue is removed from your clothing to prevent an allergic reaction. I would love to hear from others who use both vinegar and baking soda in their laundry. Tell me when you put it in, how much you use, and why you've found it helpful to do. In addition, I would love to hear from readers who infuse these products with scents, using essential oils or other natural ingredients, sharing what scents you love, and how you do it! You can also share other uses for baking soda and vinegar, together here, or read other tips which have already been submitted. Join in and write your own page! It's easy to do. How? Simply click here to return to make your own fabric softener. RonaT has shared what she does to naturally soften her fabrics as she washes them. I used to be a fan of fabric softeners until I noticed that my towels were not holding as much water as they used to. After researching on the 'net I tried pure distilled vinegar and noticed that my towels, including other pieces of clothing and beddings, became fluffier and their soaking power restored. I gathered that fabric softeners, including detergents with fabric softeners, leave a residue that cling to individual fibers. From a fabric softener fan, I am now a huge, huge fan of vinegar. I am in awe of vinegar's myriad uses and I never run out of it at home. P.S. 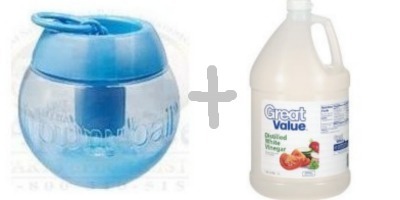 Just pour enough vinegar to fill up the dispenser for fabric softener. Thanks so much for sharing your tip. There are lots of people just like you who use vinegar fabric softener in place of the oil-based versions more commercially available. You are exactly right too, that the way the oil-based versions work is to leave a film on the fibers of the fabrics which makes it feel softer, but can interfere with the absorbency of the fabric. You can also read a tip below submitted by another reader for how she dispenses the vinegar onto her clothes for use as fabric softener since she doesn't have a fabric softener dispenser on her washing machine. Directions: Add to machine during rinse cycle just like you would a commercial softener. ***Note: When removing clothing from washer to dry, they will smell like the vinegar. 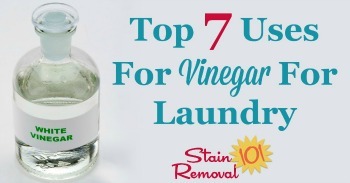 You can get even more ideas for how vinegar is used for laundry here. Tamie shared this great use for a Downy ball with me. I make my own laundry detergent and use vinegar for my fabric softener. The downy ball is my favorite tool for dispensing the vinegar. Thanks for sharing that great tip Tamie for how to dispense vinegar fabric softener. The great thing about the Downy ball is that it is designed to open and release its contents during the final rinse stage of the washing. Normally, that is when you would release more traditional oil based fabric softener. Of course, that is also the time in the washing cycle you would release vinegar so that it can help soften your clothing naturally. 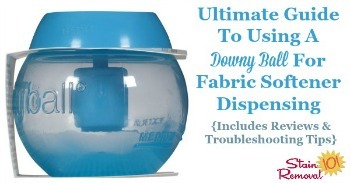 You can read my article, the ultimate guide to using a Downy ball here. In addition, if you make your own fabric softener like Tamie I would love to hear your recipe. You can share your recipe to make your own fabric softener here, or read other recipes already submitted. We live in an area with extremely hard water. I’ve added vinegar to the rinse instead of fabric softeners and it works, to a point. I’ve used white vinegar for baby clothes instead of fabric softener, and the smell always went away after line drying, but when used on my and my husband’s clothes, the wrinkles were very hard to iron out and the clothes were stiff as cardboard. On bath towels and kitchen towels, it works fine so no issues there. Advantage is that it’s extremely cheap: about 35 cents a litre versus 4 euros for a litre of fabric softener. I've used vinegar as fabric softener for years. I don't even notice the smell when the clothes come out of the washer. Even for hang-dry items, once dry, there is no vinegar odor. I have vinegar in a spritz bottle to get wrinkles out of clothes too. Spray on wrinkles until damp, pull or smoothe out wrinkles, let dry, and voila! Wrinkles gone without having to get out the iron. It does take 10-20 minutes for the smell to dissipate, so it's not a quick last minute solution. I usually leave the garment hanging in the garage to dry. I use vinegar instead of fabric softener with my new HE dryer because the nice man that brought it out and hooked it up said that fabric softeners clog up the lines inside the machine. He said that vinegar is a great fabric softener and also helps keep the machine clean from hard water or lime build up, in the process of using vinegar over time I noticed that my laundry felt and smelled better and as was said my towels absorbed better. It only takes 1/2 cup in rinse dispenser of washing machine. Save your machine and clothes. I suffer from incontinence so a lot of my washing is knickers and nighties which are not really stained just soiled and a bit smelly. I put them in my washing machines 30 minute cold rinse cycle, which does two complete water refills, with half a cup of water of white vinegar. It removes all odours and leaves them clean and neutral smelling. 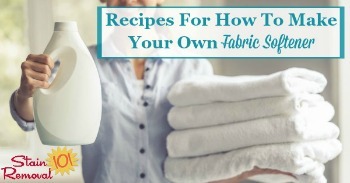 If my towels and bedding just need a freshen up they are done the same way. My carer queried this way of washing at first but doesn't now, after sticking her nose right into the items after washing, honest :) now she does the same, not only saves on fabric softener and washing powder saves a heap on electricity! If any items do need a proper wash I put it on the minimum cycle with half the amount of washing powder and vinegar in the rinse cycle, works for me. Baking Soda Wipes Out Odors! 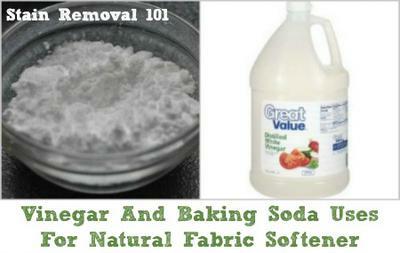 I use baking soda to wipe out smelly odors when washing white socks or doing my dogs blankets and his bath towels. Occasionally I will forget to take wet clothes out of the washer when they are finished washing, leaving a rancid odor on the clothes. I just add 1/2 c. of baking soda then turn on the rinse cycle for a quick rinse. Everything is fresh smelling again, it really works! I just recently started making my own detergent. I use 1/3 cup water, 5-10 drops lavender castille soap, 1/2 tablespoon of baking soda and mix it together. It's been working well for me but want a little boost, so today I'm gunna try adding my detergent then later adding the 1/2 cup of vinegar so they don't react like they do when directly added together. I also make my own dryer sheets with water, mix of essential oils such as lemon, eucalyptus, just enough so it smells how I want, any a bit of white vinegar. I use dust cloths to soak up the mixture and use them as counter wipes in the meantime. They get dirty I was them and throw a different clean one in the dryer and they'll soak all over again. My clothes feel so soft and smell clean, not necessarily like the sheets but I can't complain, just purely cleaned. I don't like when I can smell other people's detergent so strongly in public when there's no need to use such harsh chemicals. I'm so happy with the results of vinegar and baking soda as cleaners, I've replaced most things with one or the other, and sometimes both. Well, I've been doing opposite, using only to first line on HE detergent then filling to the max with vinegar and putting about 1/4 cup of baking soda in the softener dispenser and it works beautifully. This is just on my towels though. Tomorrow I'll try to switch and see the result lol. I use 3 clean tennis balls in the dryer for towels and no fabric soft sheets. The way I have been washing with 1/4 detergent 3/4 vinegar, I do a second rinse cycle to get rid of the vinegar. Could the baking soda clog my washer pipes or damage anything? I have replaced fabric softener with vinegar several years ago. I fill the softener cup in my clothes washer with vinegar. I sometimes add it to the bleach cup too, especially when I am washing towels so the detergent doesn't stick. After reading the article I will start adding baking soda instead of the additional vinegar. Thanks. I have been adding baking soda to my wash & white vinegar to rinse with almost every load of laundry. A few times I tried apple vinegar for some moldy smelling clothes and the smell was completely out. I don't really know which vinegar is best. I have bought many Costco size white vinegar bottles that I intend to use up. I think it helps a great deal with odors & brightening. I am trying to stop using fabric sheets as I know they are full of toxins. My daughter insists on buying and using them and I want to be rid of them. Do you think foil balls will help with static in the dryer? I don't know if I trust this idea. Someday, I'll get organized enough to make my own washing soap. Does the vinegar smell stay on the clothes if you hang them to dry? My husbands clothes shrink in the dryer so I hang all of them but wouldn't want them smelling like vinegar since they can't be put in the dryer. Where do I put the baking soda? I use liquid soap for laundry on its dispenser, per your suggestion will put the vinegar in substitution of fabric softener. But where to put the baking soda? My washing machine locks entire circle? I have a front loader. Also, doesn't the vinegar damage the machine if I put in in the dispenser? Thanks! I use vinegar in the softener dispenser and in the bleach dispenser. Vinegar cleans and softens clothes. This is true - I put vinegar into the fabric softener dispenser. The washing does smell of vinegar after removing but does not retain that smell when dry - just a fresh clean smell! This is a common question. In my experience (and from hearing from many readers about this issue), no, the vinegar smell does not stay in the clothes or the dishwasher. The smell actually dissipates quickly. I'd love to hear other people's experiences as well though. Have you found the same thing I have? does the vinegar smell continue to stink? 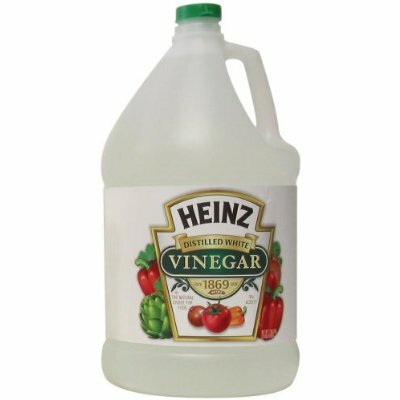 When using vinegar in the wash or in the dishwasher do the clothes/dishes come out smelling like vinegar? I put both vinegar and baking soda into my washer before the washer is full of water. I also add the detergent during the filling. They work beautifully and I don't use a dryer sheet at all.